As with every first Friday of the month, everyone is looking forward to the release of non-farm payrolls out of the U.S. as dumb money managers make trading adjustments based by this lagging indicator. Since 90% of financial markets are comprised of dumb money investors such as mutual funds this economic data point always moves financial markets. I am sitting in my office monitoring our trades across all hedge funds as I wait for the release of the NFP. Japan spooked global markets as it collapsed two weeks ago and continued correct being down over 18% and coming close to official bear market territory according to dumb money standards. Smart money comprehends that the Nikkei 225 already collapsed into a bear market given the strength of the violent sell-off in the short period of time. Those who wanted to go long after a small correction were stopped hours or days after they tried to go long. Abe failed as expected, Nikkei 225 down, Japanese Yen up and Abe should be out. The Fed picked up the torched scarring dumb money with their new bad word of choice, tapering. The only reason U.S. equity markets and to a smaller extend global equity markets managed to rally was due to the Fed’s stimulus. Currently the Fed decides to waste $85 Billion of taxpayer’s money per month for no good reason. Once the taper or even extend financial markets will come crashing down back to reality. A healthy equity market wants strong employment figures; that is when you know that the rally is valid. 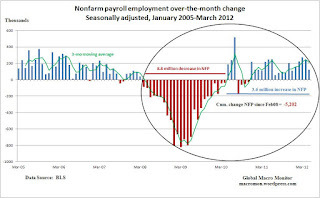 The fear prior to the release was that NFP data would give the Fed a reason to taper stimulus and eventually exit it. Dumb money hoped for figures which were lukewarm and do not point to stable economic growth so that the Fed may continue to artificially pump up equity markets. Flashback dumb money; the Fed should not even be in equity markets. All the gains dumb money witnessed in their portfolios will evaporate rather soon. This reverse and perverse approach is pathetic. NFP clocked in at 175,000, but negative revisions shaved off 12,000 jobs in March and April while the unemployment rate rose to 7.6%. Dumb money cheered and ignored the first crack in unemployment data which points to an even weaker economic picture than anticipated. Most economic reports showed that the economy is in worse shape than dumb money hoped for and that there is an extreme disconnect between equity markets and the real economy. Such a drastic gap is not unheard of and the last major gap which formed was between 2007 and 2008. Eventually the gap will close and equity markets return closer to fair value which in the case of the 2008 meltdown saw equity markets shed roughly 50%. The disconnect after that has been far greater and it should not come as a shock to see a correction of 75% or which will unfold during the rest of the decade. I am running some numbers and basically confirm our prediction of a major market crash. Next decade we may see the S&P 500 trade at actual fair value which is below 500. The only fair value is book value of companies and not expectations of what may happen. Next decade will see a complete shift in evaluations of companies and this decade long hyped up boom and bust will have a much need bust for good which will force market participants to rethink how to evaluate public traded companies and that it makes no sense to pay 20 times what a company is worth based on hope.